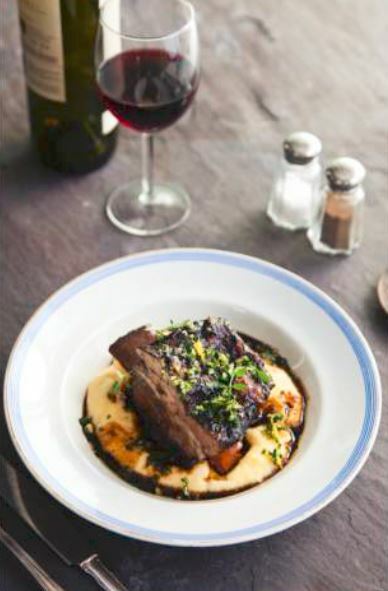 If you’re hosting a dinner party, braised Irish beef short ribs with red wine is an ideal choice for your main; a rich, warming dish that’s slow cooked to succulent perfection. If you’ve never had beef short ribs before, you’re missing out on one of life’s great pleasures. Beef short ribs should be so tender that the meat literally falls off the bone with a fork. Serve them with soft Parmesan polenta as suggested here, or they are also delicious with creamy mashed potatoes. To make the marinade, place the olive oil, thyme, orange rind and garlic in a large zip-lock bag and add the ribs. Then rub this marinade mixture into the ribs. Chill for at least 4 hours overnight is best. Allow to come back up to room temperature before cooking. Preheat the oven to 150ºC. Heat a frying pan over a high heat. Wipe the marinade off the ribs and season them, reserving the marinade. Add to the frying pan in batches and cook for 6-8 minutes on each side until golden brown. Heat the oil in a large heavy-based casserole (big enough to hold the ribs in one layer). Add the onions, carrots and celery along with the reserved marinade and cook over a high heat for 5 minutes. Pour in the wine and bring to the boil, then cook for a few minutes scraping the bottom of the casserole with a wooden spoon to remove any sediment. Pour in the stock mixing Add the ribs in one single layer and cover with a lid. Transfer to the oven and cook for 2-3 hours or until the ribs are completely tender but still holding their shape. When the ribs are cooked, transfer them to a dish with a tongs and cover with clingfilm. Strain the braising liquid into a pan, discarding the vegetables and whisk in the treacle. Then simmer over a low heat until reduced by half, skimming off any fat and scum that rises to the top. Pour back over the ribs.